I’ve been raving about roasting broccoli and cauliflower for quite some time now. It has transformed my relationship with both of these (often uninviting) vegetables. Whereas once I might have approached a head of broccoli in my fridge in much the same way as the homework that I just couldn’t be arsed getting around to doing, I now get stuck into their florets with great ferocity and enthusiasm. 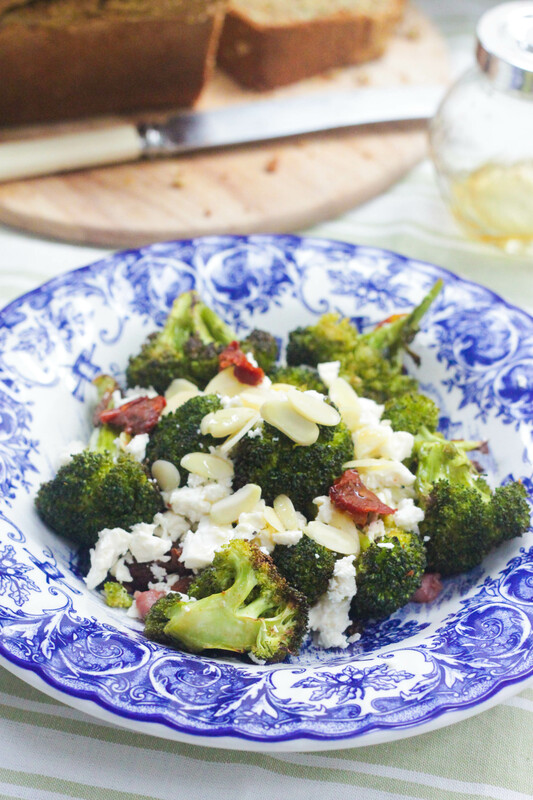 I whipped together this extremely quick and simple lunch of roasted broccoli, which made for an excellently comforting winter salad. I think a lot of us have great aspirations to detox a little bit at this time of year. But most of the time the cold weather has you reaching out for the carbs instead of the veg. This is the type of warm salad that is soothing to your soul without leaving you with the guilty aftertaste of a meaty pie. I used bacon in this recipe but I think I will leave it out the next time. I often throw a bit of bacon into dishes like this to add a bit of extra flavour, but in fact, the sun-dried tomatoes had that covered and the bacon was a bit redundant. I’ve kept it in the recipe but I’ll leave it up to you as to whether you want to use it or not. Start by heating your oven to 220C/fan 200C/Gas Mark 7. Cut your head of broccoli into bite-sized florets and rinse them under cold water. Chop your bacon into lardons (if using). Remove your 5 or 6 sun-dried tomatoes from the oil in the jar and chop into chunks. Peel the clove of garlic and finely slice. 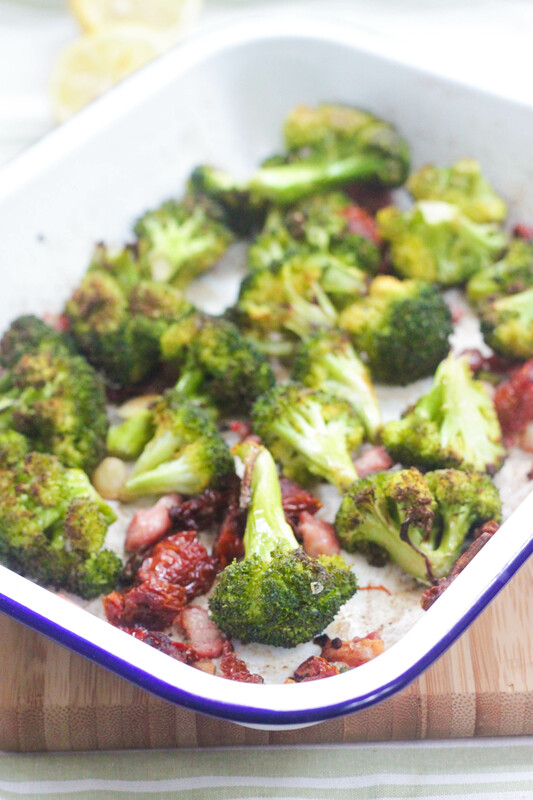 Mix the broccoli, bacon (if using), sun-dried tomatoes and garlic in a roasting dish. Season with a pinch of salt and pepper and drizzle with olive oil, about 1 tablespoon should do it. 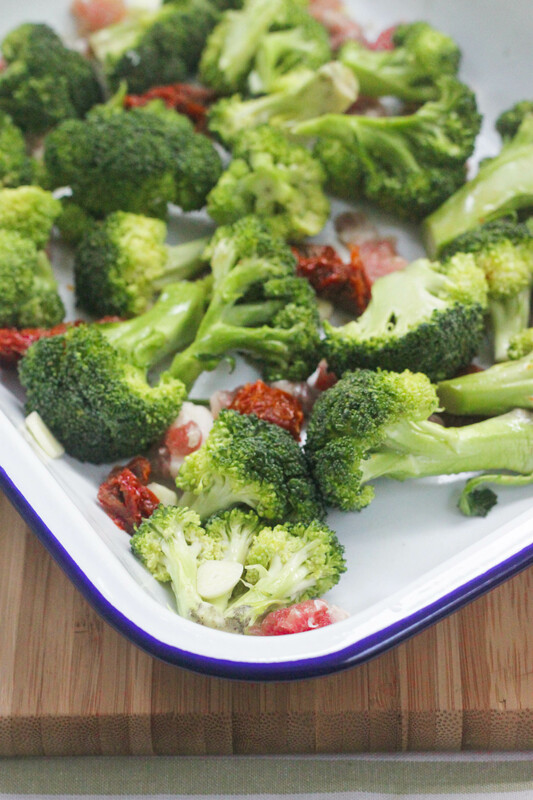 Roast them in the oven for 15 to 20 minutes until the broccoli has started to blacken and crisp around the edges. Meanwhile, mix together the dressing ingredients. I use a small jar with a lid. This honey and chilli dressing is wonderfully versatile and is my go-to salad dressing when I’m in a rush. When the broccoli has had 15 minutes, remove from the oven and squeeze the juice of your half lemon over the lot, mixing well. Divide the mixture into two bowls, and crumble a handful of feta and scatter a handful of flaked almonds into each serving. Finally, drizzle over as much or as little of the dressing as you like. And that’s it! You’re done. Pretty healthy but also warming. What a win. And lovely served with some crusty brown bread on the side. You can have a listen to my RTÉ 2xm Right Click Radio show from last week, which features tunes from We Have Band, Le Sera, White Collar Boy, Miike Snow and quite a few more. Enjoy! Ah, roasted broccoli! I love it in all its forms but roasted is definitely nicest. Love the sound of that dressing, too – might have to lash some of my remaining #firebee stash in it when I try it out! I think when given the option to keep or leave out the bacon … I would always opt to keep it in. This sounds delicous and love the feta topping too. BEST IDEA EVER! You’re a genius. Anchovies would absolutely work in this! Still though – it works as a veggie salad. But anchovies would definitely be the way to go over bacon. For sure! Looks delicious. Love roasted broccoli, cauliflower, cabbage, Brussels sprouts, etc. Roasted some cabbage last night, in fact. 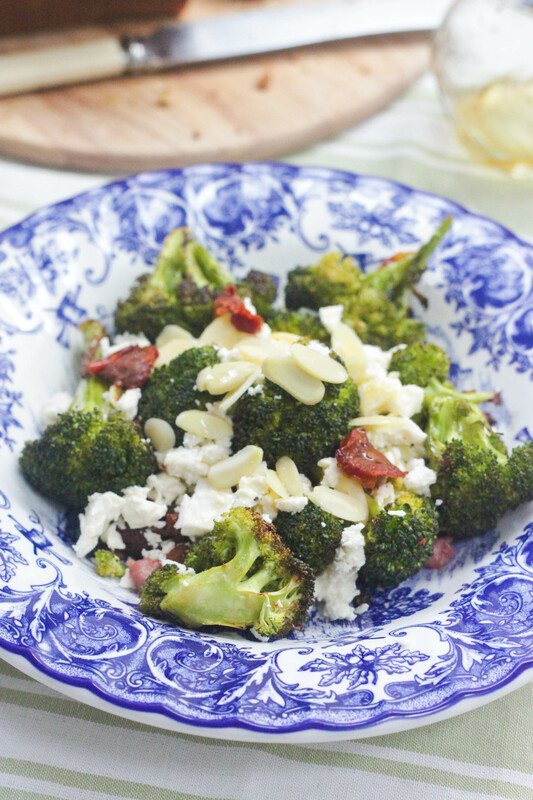 This salad is reminiscent of what we call the “Dublin” salad (actually Avoca) of broccoli, cherry tomatoes, hazelnuts and feta but with more concentrated, wintery flavors from the roasting and sun-drying. Amazing that it’s called the Dublin salad! I know the very salad you’re talking about too The sun-dried tomatoes definitely work in this as it brings a bit of cheat’s summer to a wintery dish. I’ve yet to give brussels sprouts a roast, I hear it’s a winner! And will keep cabbage in mind too, how did that turn out? And what did you put with it?